As the old song goes, "I was built for comfort, baby, I ain't built for speed." 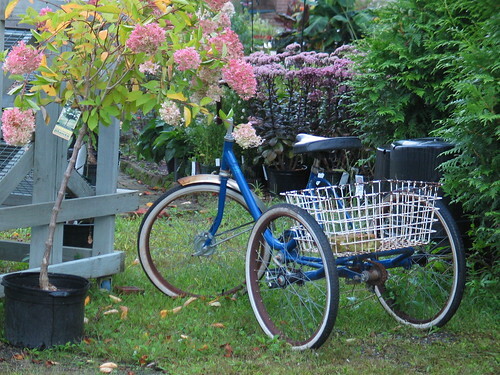 Great combination: soft pastel colours, nature, and then the bike with hard geometric lines in the basket. Very nice! Fantastic shot! Wow, you have really been nailing them lately! As I get older, these bikes are becoming more appealing to me. Nice photo. I'm not sure how comfortable that looks though. Hi Lisi, no it's a local nursery. The tree in the foreground looks like a hydrangea, and the plans in the background are a variety of sedum. "Autumn Joy" is popular but I don't think the leaves are that dark so not sure. Beautiful shot!! Looks pretty comfortable to me!